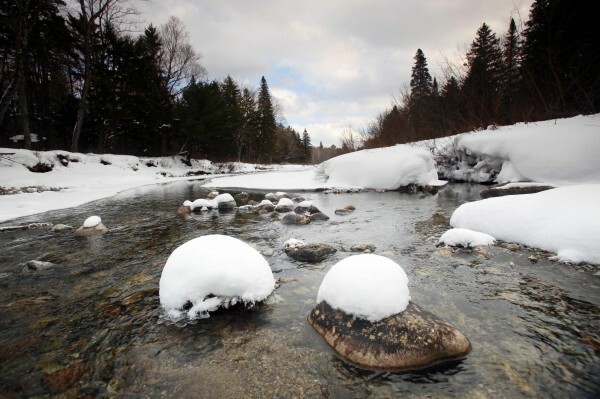 Wassataquoik Stream flows through Township 3, Range 8, Maine, on land owned by Roxanne Quimby, in January 2011. Quimby has offered to donate a 70,000-acre parcel she owns to create a national park adjacent to the state's Baxter Park. Former state Senate president Charles Pray wants a study that looks beyond the scope of a national park's possible effects on tourism and looks at its broader implications. 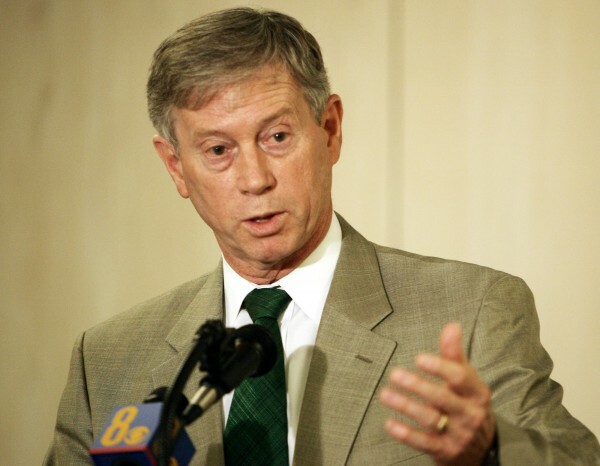 Former Maine Sen. Charles Pray speaks during a news conference in April 2005 in Washington. Pray wants a study that looks beyond the scope of a national park's possible effects on tourism and looks at its broader implications. MILLINOCKET, Maine — As a public debate over a northern Maine national park becomes politicized, a former Maine Senate president is calling for a broader look at the future uses of the region. Charles Pray, who represented the region encompassing the park for nearly two decades, said he wants a study that goes beyond the scope of a park’s effects on tourism and looks at its broader implications in the part of the state where logging and outdoor recreation are important economically. Pray, of Millinocket, calls his effort TREES, which stands for Trust for Responsible Economic and Environmental Stewardship for Maine. Pray’s effort is a response to an offer from conservationist and Burt’s Bees founder Roxanne Quimby to donate 70,000 acres for creation of a national park in 2016. The park would border the 200,000-acre-plus Baxter State Park. The former Democratic senator is establishing a nonprofit organization that will seek citizens’ response to the park proposal, among other endeavors. Pray maintains the debate is too one-sided in favor of the park, and he envisions public and editorial meetings, a letter-writing campaign, attendance at pro-park meetings, and interaction with Maine’s Congressional delegation. In August, U.S. Interior Secretary Ken Salazar came to Millinocket to augur local residents’ views on a federal feasibility study of the park. While residents attending a public meeting seemed evenly split on the study, both Millinocket and East Millinocket have taken formal stands against the park or study. Pray, a former federal official who worked in energy and nuclear safety issues under presidents Bill Clinton and Barack Obama, is concerned the federal study would be too limited in scope and fail to address the needs of Maine. His study would cover the broader needs of the region, beyond the effects of a park. “It’s being pushed too hard too quick, not allowing us to look at the larger impact, the larger implications,” said Pray. Statewide snowmobiling, forest products and hunting-fishing organizations have also taken hard stands against the park plan. Quimby also raised the ire of area residents after describing Maine as a “welfare state” in a national publication, leading her to apologize and ratcheting up the level of vitriol against Quimby. She also cited the support of more than 40 of the region’s businesses, as well as snowmobile clubs and residents. She said that while the pulp and paper mills are “absolutely critical” to the region, a national park would diversify the area’s economy and create jobs. “The two can coexist and the region can thrive,” Quimby’s statement said. Pray also believes Maine needs to be looked at in the context of its high proportion of privately owned land, which people have been accustomed to using for generations, and record of public-private partnership keeping those lands open to the public.